Noah Wardrip-Fruin is a Professor of Computational Media at the University of California, Santa Cruz, where he co-directs the Expressive Intelligence Studio, a technical and cultural research group. He also co-directs the Playable Media group in UCSC's Digital Arts and New Media program. 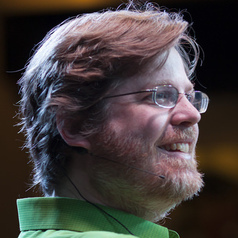 Noah's research areas include new models of storytelling in games, how games express ideas through play, and how games can help broaden understanding of the power of computation. Noah has authored or co-edited five books on games and digital media for the MIT Press, including The New Media Reader (2003), a book influential in the development of interdisciplinary digital media curricula. His most recent book, Expressive Processing: Digital Fictions, Computer Games, and Software Studies was published by MIT in 2009. Noah's collaborative playable media projects, including Screen and Talking Cure, have been presented by the Guggenheim Museum, Whitney Museum of American Art, New Museum of Contemporary Art, Krannert Art Museum, Hammer Museum, and a wide variety of festivals and conferences. Noah holds both a PhD (2006) and an MFA (2003) from Brown University.